As the rest of the Video Production class watched, actors from the Modern Acting and Theater class rehearsed three scripts. The material had been chosen by instructor Vince Nelson, who narrated some of the scripts. There were two cameras recording, and three student directors were taking notes. Actors from the Modern Acting and Theater class auditioned in front of the Video Production class on Nov. 16. 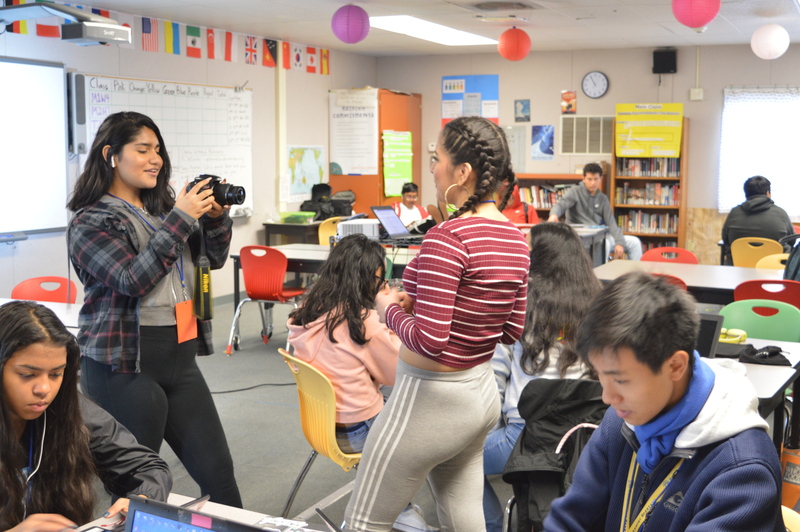 During this round of Expeditions, Mr. Nelson’s video class and the acting class taught by Ron Johnson, who goes by Mr. Jay, have been collaborating with each other. “Everyone has different skits; everybody has their own role,” Rainier sophomore Michael Ybarra, a video production student, said. The Video Production class has 30 students. The class is split into three groups and each group has a director. After the auditions are over, the directors choose the actors they want and the scripts the actors are going to use. Each group is composed of a director, assistant director, cameraman, assistant cameraman, editor, sound mixer, boom operator, script supervisor, art director and actor. The director is in charge of the actors and location scouting. The assistant director is in charge of time, calling for sound, and calling for slate (calling out what scene is being filmed). The cameraman is in charge of recording, camera angles, and lighting. The assistant cameraman is in charge of slating and taking care of the camera. The editor is in charge of editing and uploading audio and sound files. The sound mixer makes sure the audio is good quality. The boom operator makes sure the microphone is not in frame and gets the boom as close as possible to the subject. The script supervisor takes note for every take and records the audio file name. The art director is in charge of props and clothes for the actors. The actor has to remember their lines and act. “It’s honestly like everybody seems to be getting along very well,” Mr. Nelson said. The two classes did not experience any problems working together. “It makes a community not just because we get along, but it helps each other learn,” Ybarra said. “Once you have two classes that overlap. All of the sudden each of the two classes become more than just a class because I have a lot of people who were in my class who preferred acting over video production and they are in this class in order to be able to act. 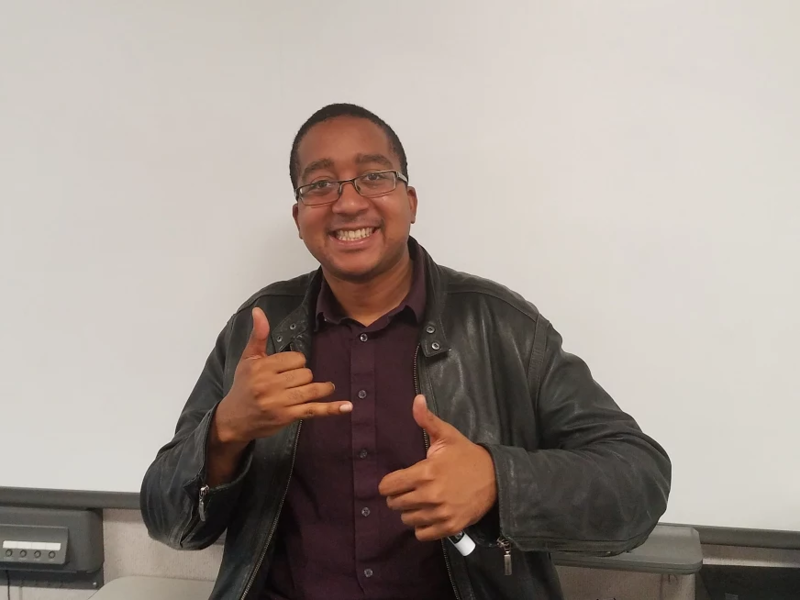 Then he [Mr. Jay] has kids who are in his class who want to be able to do video production but they are in his class for the same reason. So once you join two classes into one for a couple of things, all of the sudden the people who are not sure if they want to do acting or be a director, they are able to learn more and learn exactly what they are looking for, you know because I don’t want one person that is just doing one thing,” Mr. Nelson said. Each role in making a movie is very different. A director has to be a leader because they have to direct a film crew. An editor has to work on a computer to alter different scenes, which takes a long time and requires patience. “For example, for me, I love to write, that’s my number one; and my number two is to produce; my number three is to direct; and my number four is to act. But they are all in a giant circle and that goes for everybody in here. Everybody wants to do one thing more than every other thing, and when you incorporate the acting class into that it’s more options for everybody,” Mr. Nelson added. Actors from the acting class might not know the students from the video class, and the filmmakers of the video class might not know the actors from the acting class. Actors and filmmakers have to work closely together to make a movie. “Working together makes us closer, and we know each other better,” Rainier sophomore Jakob Tilbury, an acting class student, said. The video and acting classes make a community by having the goal of making a movie together.